It can be hard to find a restaurant that has just the right amount of atmosphere. And by that, I mean cozy lighting, warm decor, simple food that is executed beautifully. I am so excited when all of these elements come together like they did at Barbuto in far west West Village. Barbuto is Jonathan Waxman’s Italian inspired charmer located just below the busy Meatpacking but what a difference a few blocks make. The neighborhood is quiet and relaxed, a feel that is very much reflected inside the restaurant. I loved the dining room with its all glass garage door that spans the entire length of the room as well as the open kitchen and the burning oven. The room was filled with a low buzz of conversation, underscored by soft melody in the background. With all of these elements in place, it makes it that much easier to sit back and enjoy the food. Appetizers or antipasti here are light, mostly of salads of with seasonal ingredients. 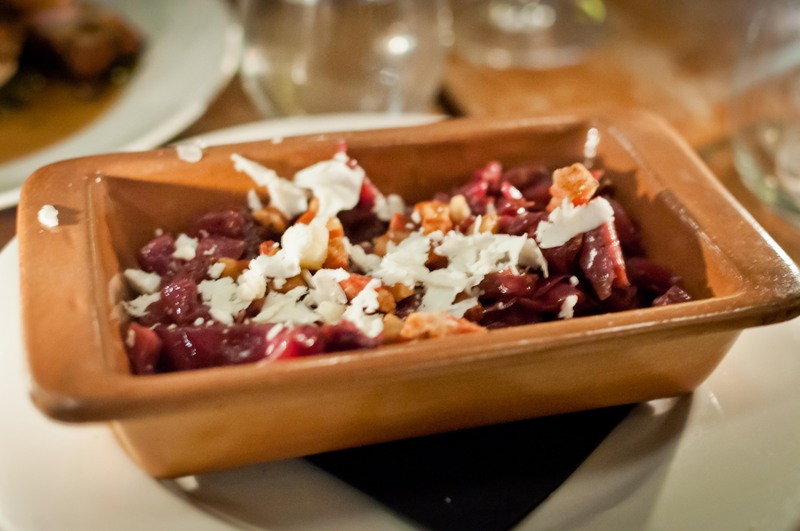 I adored the insalata cicoria, a medley of radicchio, frisee, pancetta and candied walnut. 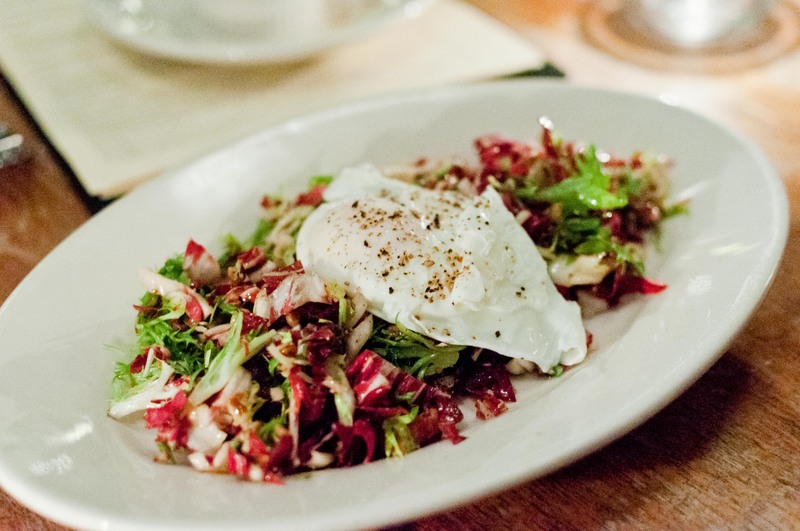 To top it all of, a soft poached egg to bind together the lightly dressed greens. The sweetness from the walnuts and the saltiness from the pancetta balanced out the bitter greens. 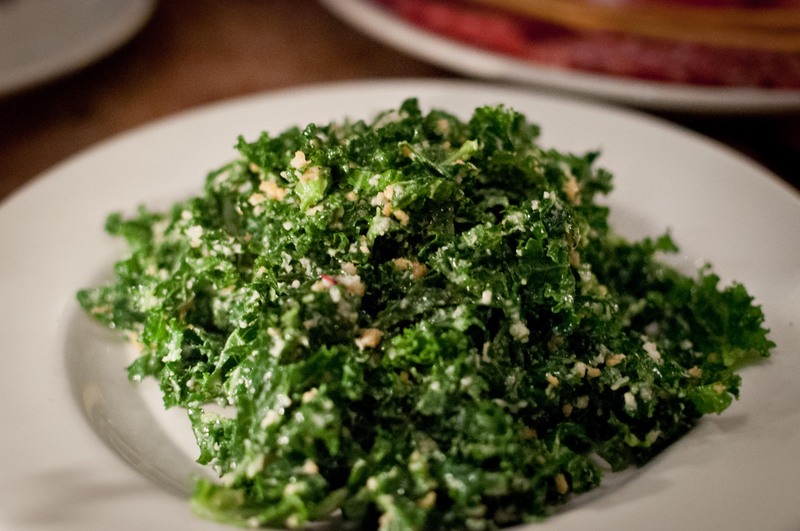 The insalata cavolo verde is Italian for kale Caesar. I know it is the single biggest cliche of 2012 but Barbuto does a fantastic preparation of the popular vegetable. This was cheesy from the pecorino and savory from the anchovies, just like a well made Caesar salad should be. 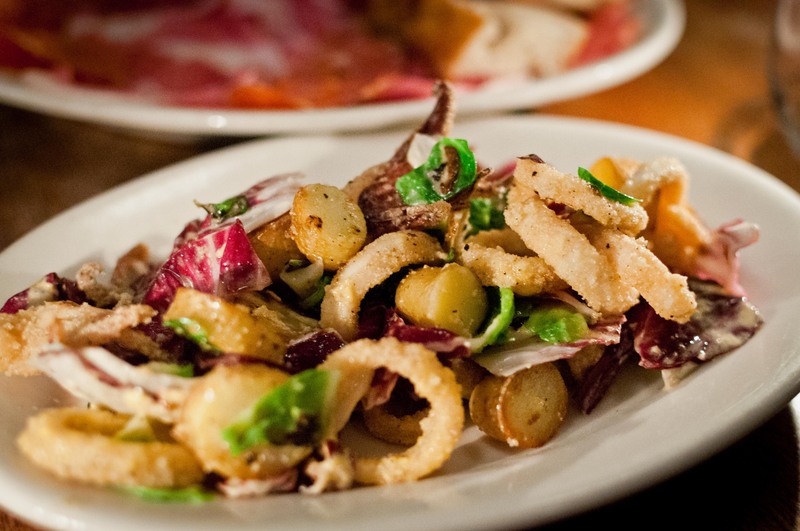 For something a little heftier, the fried calamari with fingerling potatoes should fit the bill. This was just a tad too salty one particular night but I do adore all the elements of the dish so I powered through. 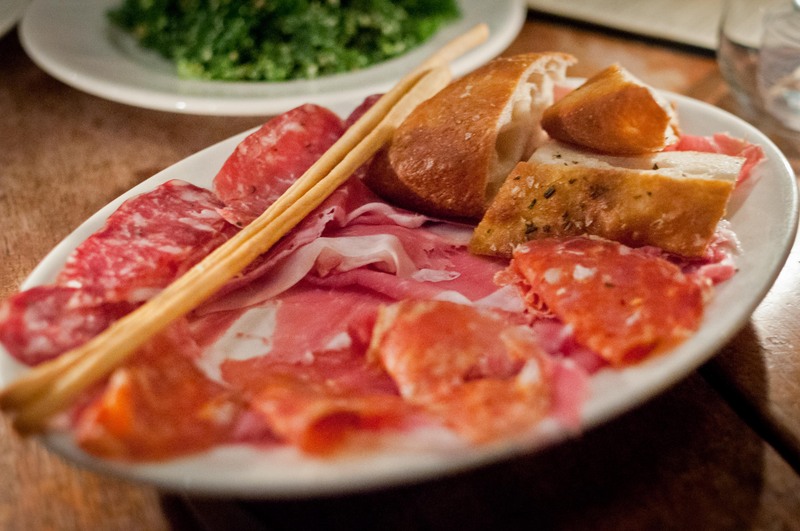 Of course, you cannot go wrong with the salumi platter. When it’s something this simple, the ingredients must be of the top quality and luckily, Barbuto did well with its choices of prosciutto di parma, soppressata and cacciatorini. 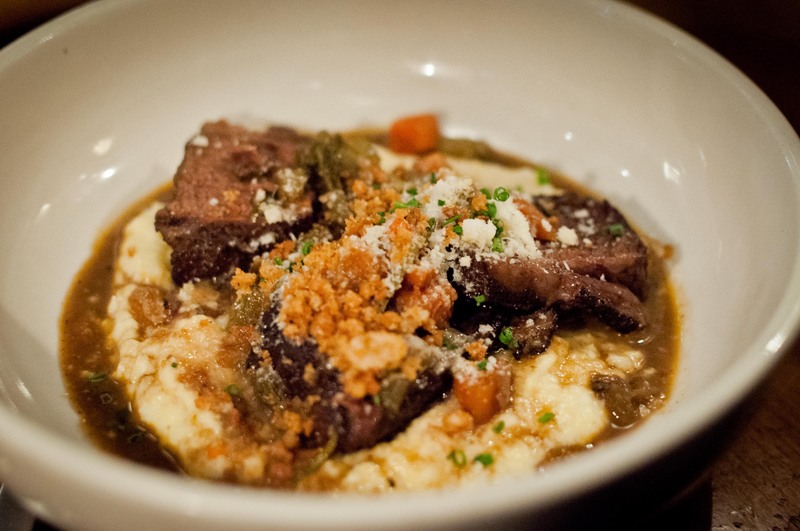 The piatti unici of the menu consists of the heartier meaty dishes, whether you are in the mood for juicy pork loins served with braised greens or tender braised short rib with polenta. Both were incredibly flavorful so you cannot go wrong either way. 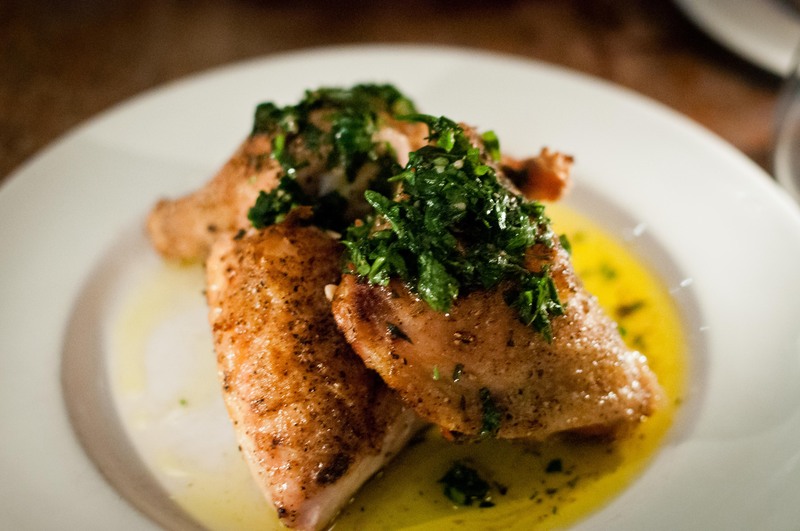 However, what Jonathan Waxman is famous for is his roast chicken, simply plated with a drizzle of salsa verde. I can see why people make a fuss about it. Even though it might not be the best I have ever had but I can appreciate the beautifully crispy salty skin and the tender moist meat. The chicken comes without sides so you will want to supplement it with one of the contorni. The hearty winter braised cabbage with walnuts and ricotta has a lovely tang that made it so lively and almost more than a side dish. You will think that you are too full to indulge in dessert but a delicious meal should always be sealed with a little something sweet. 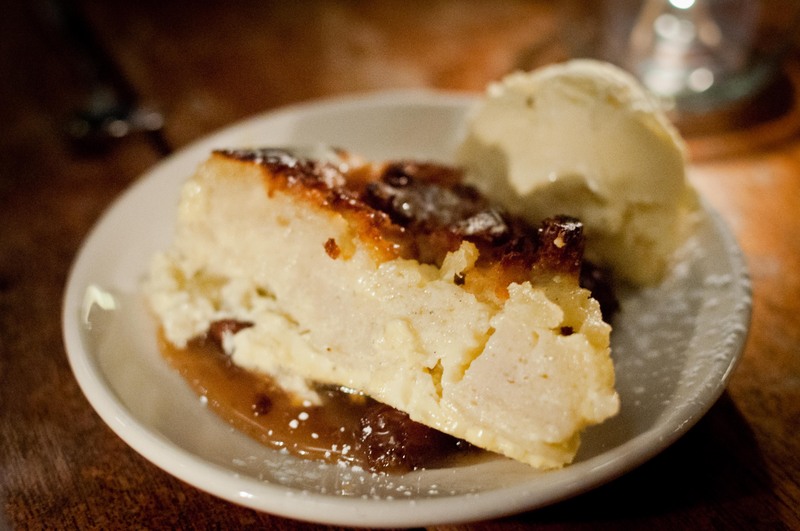 For example, the slice of classic vanilla bread pudding with caramel and gelato is just light enough and sweet enough. 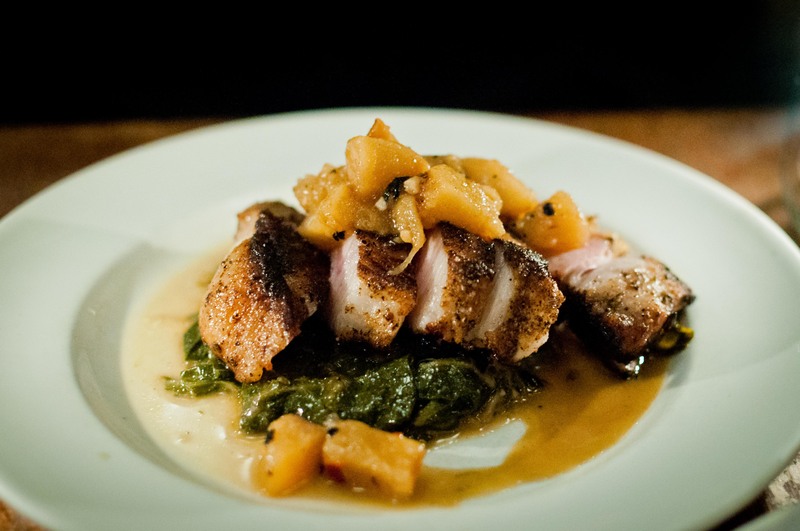 Even though Barbuto is known for Jonathan’s famous pollo al forno, the rest of the simple Italian-inspired menu is strong enough to stand on their own. Combined with the cozy atmosphere and approachable vibe, this might have just become my new neighborhood favorite for a casual Sunday dinner.